On this page you will find what you need to know about essential oils, the Thieves blend in particular, because I LOVE these products! You will also read the history of essential oils, how to use them and how to order them for your own personal use. What is the Thieves Story? The oil blend that comprises Thieves is known for enhancing complete health and total well-being. Each of the oils selected makes Thieves one of Young Living's most effective and favorite products. Naturally energizing and may be beneficial for helping restore mental alertness when experiencing fatigue. 1. Sue Chao, Craig J. Oberg, D. Gary Young, "Effect of a Diffused Essential Oil Blend on Bacterial Bioaerosols," J. Essent. Oil Res. 10, 517-523 (Sep/Oct 1998). Add 1–2 drops into a spoonful of Young Living's Blue Agave. Drop 1–2 drops directly onto your tongue. effective alternatives for use in the home! A very good way to begin to lessen your eco footstep, is to start with Thieves Household Cleaner. There is NO NEED any more to use harsh or abrasive chemicals to clean and freshen! Tough stains and problem areas in your home, business and schools become simple and easy to clean. While bacteria can be dangerous, some industrial cleaners on the market pose an even larger threat to your health. 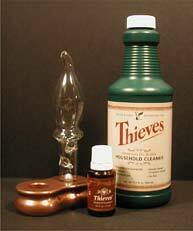 Thieves is a superior natural alternative to chemicals and cleans fantastic! The anti-microbial power of Thieves combined with a non-toxic coconut oil based cleaning solution is safe for your whole family. Thieves Household Cleaner is a natural all-purpose concentrate that can be used in every room in your home, without the harsh chemicals. Room deodorizer: diffuse Thieves oil! SAFE way to kill pesky ants in your house! Dilution ratios are listed on the label for your convenience. Note: one capful of thieves cleaner = ½ tbsp. [Note: Before cleaning fabrics, perform a spot test in an inconspicuous area. Thieves essential oil blend with Young Living’s patented diffusing system creates a safe and simple means of filling your home with therapeutic benefits. Many forms of bacteria and mold spores linked to many common ailments can travel through the air. Diffusing Thieves adds an extra layer of protection by purifying the air while adding an uplifting scent to your home. A diffuser is a special air pump designed to disburse essential oils in a micro-fine vapor where they stay suspended for several hours to reduce airborne infectious pathogens, fungus, mold and freshen the air with natural fragrances. Diffusing therapeutic-grade essential oils releases oxygenating molecules as well as negative ions, which reduce bacteria in the air (air purifier, ionizer). Young Living's diffuser (vaporizer) uses a special air pump custom designed to disperse the oils in a micro-fine vapor so they stay suspended for several hours and freshen the air with natural fragrances. The diffuser disperses essential oil without the heating or burning that can render the essential oil therapeutically less beneficial. Protect your environment from bacterial invasion by using aromatherapy with essential oils. Essential oils can prevent and protect the the body from bacterial invasion. Essential oils have been used since ancient Egypt, as they protect against pathogenic health disasters. You can take essential oils two ways, by diffusion and direct application. When essential oil is diffused into the atmosphere of a home or office, the air becomes purified, purged of harmful bacteria, fungus and mold with 100% effectiveness. Essential oils kill and destroy infectious bacteria within seconds of contact. Aromatic molecules are breathed into the body, where they trigger numerous immune-boosting, healing and relaxation responses. Many people diffuse three times a day for 10 to 30 minutes each period. The benefits are immense when one considers the health hazards we expose ourselves to daily. But D. Gary Young, founder of Young Living, is probably most responsible for the story reaching the legendary status it enjoys today. 1. Sushil K. Shahi, A. C. Sukla, et al., "Broad Spectrum Herbal Therapy against Superficial Fungal Infections," Skin Pharmacol Appl Skin Physiol. 2000; 13:60–64. This is the period of time responsible for the bizarre images of physicians wearing dark robes, wide-brimmed hats, and masks with long beaks. These beaks held dried herbs, spices and essential oils which the physician breathed. The robe was doused with a similar fragrant concoction. Scientific evidence today is building support for this seemingly outrageous behavior. Many harmful microbes can't survive in the presence of certain essential oils. 1 -Determine if you have toxic mold by getting a specialist with proper credentials to ascertain the situation. 2 -Diffuse Thieves Oil Blend in the affected rooms non-stop for 24 hours at least. A cold air diffuser is easy and very effective. 3 -After diffusing, wipe down all affected areas with Thieves Household cleaner. Always be safe - wear appropriate protective gear when exposed to and working with toxic mold! These items are sufficient for about 1,000 square feet of space. "We Have a Blend For That"
Check out our top signature essential oil blends to use for inspiring action, or for finding your moment of Zen—you just may discover your new favorite! 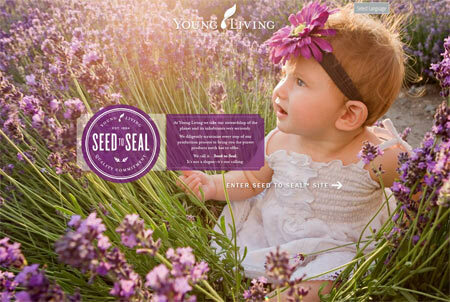 View this wonderful video, below, "Seed to Seal" from the Young Living website, featuring information on Seed, Cultivation, Distillation, Testing, and Sealing of the essential oils. You will then see why I endorse this ethical and pure theraputic essential oils company. YOUNG LIVING ESSENTIAL OILS are the world leader in cultivation, distillation, and production pure, therapeutic-grade essential oil and aromatherapy products. Interested in going green? 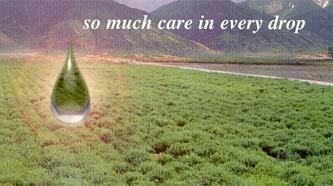 These oils and the products produced from them are very green; you could not get more green. They are the living volatile liquid from plants, its lifeforce, full of vitality and healing properties. Why Young Living Essential Oils? It's all about terroir, climate, fresh water and clean air, and a strict distillation process. How are Young Living's Essential Oils Distilled? ESSENTIAL OILS are found in the circulating vascular fluids of plants. These vascular fluids containing the essential oils perform may of the same functions in the plant's body as blood does in ours. In addition, because their molecular structure is so high in oxygen, they may help to nourish, strengthen, rebuild and restore the body to greater and more vibrant health. The oils are the immune system of the plant. Since it takes 5,000 pounds of rose petals to produce one pound of rose oil, the effectiveness of the oil is many times greater than the dried or powdered plant. Through extensive research and commitment to quality, Young Living is dedicated to growing, distilling, manufacturing, and marketing the highest-quality organic essential oils & oil-enhanced products in the world. The key to producing a quality essential oil is to preserve the delicate compounds of the aromatic plant through expert distillation. The proper process of steam distillation—passing steam through the plant material and condensing the steam to separate the oil from the plant—is strictly adhered to with all YLTG essential oils (Young Living Therapeutic Grade). Proper temperature must be maintained throughout the distillation process, and pressure, length of time, equipment, and batch size are strictly monitored. This ensures that the naturally-occurring compounds contained in each essential oil product are of the highest and most consistent bioactive levels. The reintroduction of essential oils into modern medicine first began during the late 19th and early 20th centuries. Since that time essential oils have been used traditionally to kill harmful germs, as well as spiritually to balance mood, lift spirits, and dispel negative emotions. Recognizing the hazard of using dangerous chemical-based products in the home, Young Living created a line of safe household products packed with the power and protection of Thieves. From toothpaste and mouthwash to cleaning products, hand soaps, and even throat lozenges, the Thieves product line provides safe, plantbased alternatives for use in the home. 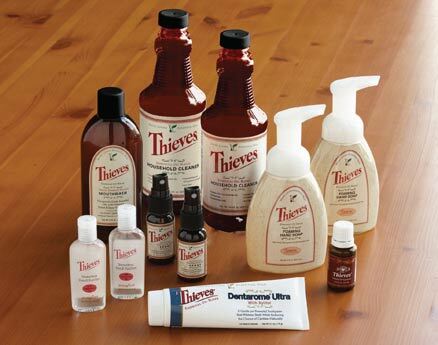 The Thieves product line offers an array of safe household products that you can feel confident about using in your home. Because of the purifying ability of the essential oils contained in the Thieves blend, these products are effective without using harsh or synthetic chemicals like many other products on the market. Every product in the Thieves line has been infused with pure, therapeutic-grade essential oils. Great care has been taken to ensure that each essential oil contained in Young Living's products meets the highest standard for purity and potency. + Thieves Foaming Hand Soap contains aloe and vitamin E, both renowned for their skinnourishing benefits. 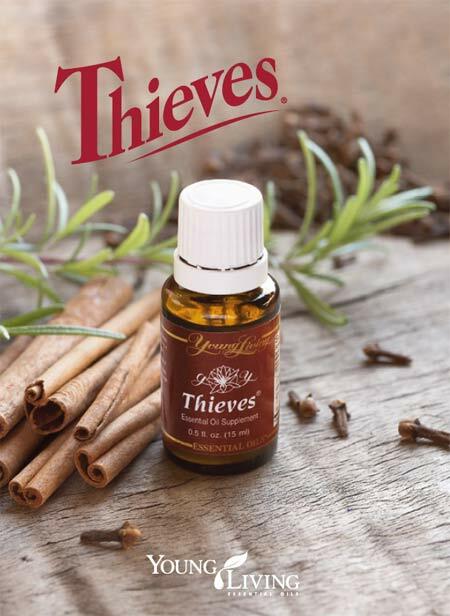 Young Living's Thieves essential oil blend contains clove, lemon, cinnamon, Eucalyptus radiata, and rosemary. See description under Product Story. your teeth while harnessing the power of pure, therapeutic-grade Thieves essential oil for fresh breath. a spray bottle or bucket, or use straight for extra strength. For your convenience, dilution ratios are listed on the label. small bottle is perfect for traveling or keeping in your purse or backpack. Waterless Hand Purifier promotes good hygiene without the use of water. 1. Sue Chao, Craig J. Oberg, D. Gary Young, "Effect of a Diffused Essential Oil Blend on Bacterial Bioaerosols,"
J. Essent. Oil Res. 10, 517–523 (Sep/Oct 1998).